Because the Print dialog box options are identical in the Organizer and the Photo Editor in Windows (with the exception for color profile management), you find the same menus and buttons when you choose File→Print from either the Organizer or Photo Editor. On the Mac, inasmuch as you can choose File > Print in the Organizer, the actual printing is only available in the Photo Editor. The Print dialog box gives you plenty of options. 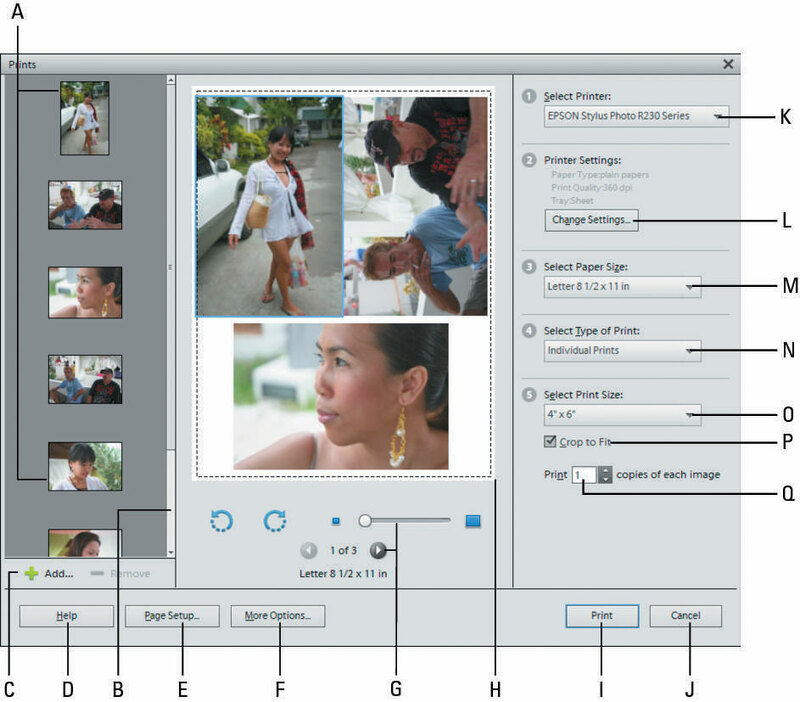 Image Thumbnails: When you select multiple images in the Organizer, all the selected images appear in a scrollable window on the left side of the dialog box. Scroll bar: When so many photos are selected that they all cannot be viewed in the thumbnail list on the left side of the dialog box, you can use the scroll bar to see all images. Add/Remove: If the Print dialog box is open and you want to add more photos to print, click the Add (+) icon to open the Add Photos dialog box. A list of thumbnails appears, showing all photos in the current open catalog. Select the check boxes adjacent to the thumbnails to indicate the photos you want to add to your print queue. You can also choose an entire catalog, albums, photos marked with keyword tags, and photos that have a rating. If you want to remove a photo from the list to be printed, click the photo in the scrollable list in the Print dialog box and click the Remove (-) icon. Help: Click the Help button to open help information pertaining to printing photos. Page Setup: Click this button to open the Page Setup dialog box. More Options: Click More Options to open another dialog box that allows you to choose additional options. Scroll Print Preview: Click the arrows to go through a print preview for all images in the list. Move the slider to zoom photos in the Print Preview. Print Preview: This image displays a preview of the image to be printed. Print: Click Print after making all adjustments in the Print dialog box. Cancel: Clicking Cancel dismisses the dialog box without sending a photo to the printer. Select Printer: Choose a target printer from the drop-down menu. Printer Settings (Windows only): Click this button to open properties unique to the selected printer. Select Paper Size: Choose from print sizes that your printer supports. This list may change when you choose a different printer from the Select Printer drop-down menu. Select Type of Print: In Windows, you have three options available — Print Individual Prints, Contact Sheets, and Picture Packages. On the Mac, these options appear as separate menu commands in the File menu in Expert mode. Select Print Size: Select from the print size options that your printer supports. Crop to Fit: Select this check box to crop an image to fit the selected paper size. Print __ Copies of Each Image: By default, one copy is printed. You can choose to print multiple copies by entering the number you want in the text box.